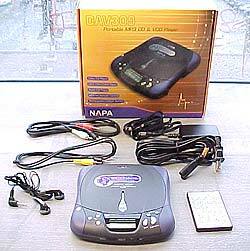 Abstract: The Napa DAV309 is hybrid CD player because it can not only play regular CD's, but also MP3's burned onto a recordable CD-RW, and even VCD's. The Napa DAV309 is hybrid CD player because it can not only play regular CD's, but also MP3's burned onto a recordable CD-RW, and even VCD's. Couple those specs with one look at this sleek and stylish little player and what more could you ask for? First impressions of the NAPA DAV309 are high when you take it out of the unassuming box. The unit also comes with some accessories you wouldn't normally associate with a portable CD/MP3 player, namely a remote control and video cables! How many portable CD players have you seen with a remote as complicated as this one? Not too many I'll bet! The DAV309 comes with a small remote control that measures 3.25" x 2". The keys on the remote enable the user control over every aspect of the player from up to about 7 feet away, and within 60 degrees of the sensor. The only key which is important and not there is the power key. Power for the unit (either batteries or through the AC adapter) is controlled from a small switch on the side. Included among the remotes 32 buttons are the following: Numbers 1-10/0, OSD, Time, Rewind, Fast Forward, R/L Mode, Play/Pause, Volume (-0), Step, Return, Volume (+), Stop, Pal/NTSC, Skip Previous, Skip Next, Slow, Mode, PBC, Tone Control, and Digest. The remote comes loaded and ready to go from NAPA with a Panasonic CR2025 3V button cell. The battery is accessible from a small port at the base of the remote which pulls out so the battery can be replaced. The battery for the remote pulls out of a small port on the bottom of the credit-card sized remote for the DAV309. The sensor for the remote is located on the front of the unit, and will work up to about 7 meters away, within 60 degrees or so.